Lia Hodge is a Project Engineer at Helix Electric, an electrical contracting company. 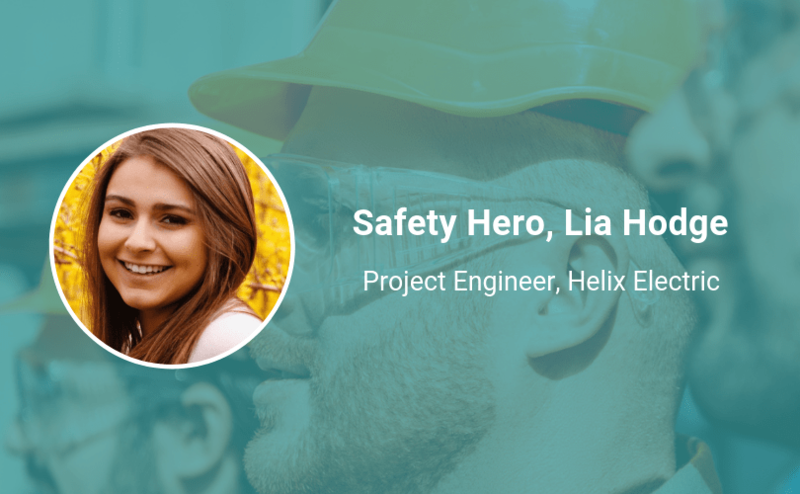 Lia’s personal approach to safety reflects one of Helix’s core values: “We will not compromise on quality and safety,” which his part of why she’s our latest Safety Hero. Keep reading to see why she says consistency is so important in safety and how she sees safety evolving in the future. Consistency in the way safety is enforced. You can’t expect people/workers to work safely if you only enforce a safe work environment half of the time. There must be a commitment from leadership and written safety policies/procedures put in place, along with someone who can make sure the policies are being implemented correctly. Safety is a full-time job, don’t make it a part-time practice. Safety isn’t just one person’s responsibility, it should be everyone’s responsibility from entry level positions to the highest. Safety isn’t just one person’s responsibility, it should be everyone’s responsibility from entry level positions to the highest. Companies need to embody safety culture and make it known that everyone needs to do their part to make sure themselves and fellow coworkers go home the way they came in. I see safety changing in the future through the advancement technology, especially in construction. The use of BIM modeling and coordination can help us assess risk and safety issues of work prior to installation. This can help us mitigate and control any unforeseen hazards ahead of time.